Sermon on Luke 24:13-35 offered to the people of the Church of the Heavenly Rest on May 4, 2014. My grandmother has never met a stranger. I know that this is said about a lot of people, but my grandmother (Babci, as we call her, and as you are welcome to call her) has raised this concept to an art form. Whenever she visited the church where I grew up, for instance, she would invariably meet someone we had known for years and come away knowing more about that person than we did (“Did you know that Barbara’s sister is moving to Barbados?” “I didn’t even know Barbara had a sister.”) There is no one my grandmother won’t talk to. There was the time that I found her talking amiably with a huge Teamster, one of these guys who would intimidate your average little old lady. He ended up showing Babci pictures of his grandkids. In many ways, my grandmother’s approach to new people shapes the way she looks at the world. For starters, she is very rarely lonely; she never lacks someone to talk to because she is willing to talk to anyone. Second, it gives her what some might consider a skewed understanding of human nature. She assumes that everyone in the world is friendly and helpful, because most of the people she interacts with are friendly and helpful to her. She doesn’t consider the possibility that her experience might be somewhat unique, and I find that very charming. Finally, Babci implicitly recognizes that true hospitality requires relationship. She has very little interest in exchanging pleasantries about the weather; she is interested in knowing what is important to other people. This is ultimately what people recognize in my grandmother; they understand that she is interested in talking with them about things that matter. They recognize her deep conviction that being in relationship means that there are no strangers. Today we hear about one of the more mystifying moments in the post-Resurrection life of Jesus. The story of the journey to Emmaus has an important place in Christian culture. It has inspired countless writers, musicians, and artists, including the sculptor who carved the frieze above our high altar. Some of you may have participated in the spiritual retreat weekend called the Walk to Emmaus. Throughout the centuries, people have connected with the story’s themes of journey, transformation, and revelation. In spite of its ubiquity, however, the journey to Emmaus is one of the more confusing stories in the gospel account. 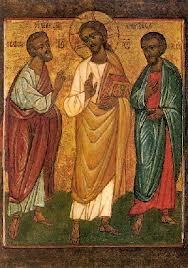 Of course, the most mystifying aspect of this account is the way in which Jesus is revealed to the two disciples. While Jesus is not immediately recognized in the other Resurrection appearances, it does not take the disciples too long to figure out who he is. In John’s gospel, Mary Magdalene does not recognize Jesus immediately (she thinks that he’s the gardener), but it’s possible that she is blinded by her grief. Cleopas and his companion, however, have a lot of time to figure out who their mysterious companion is. While they’re sad, it’s pretty clear that they are dealing with their grief. In fact, they’re downright reflective, processing what has happened to them over the past several days: “Well you see, sir, we’ve been talking about Jesus of Nazareth, a prophet who was executed and has apparently vanished from the tomb. Needless to say, we’re not entirely sure what is going on.” They’re measured and rational as they recount the story. So for all their introspection and careful observation it’s a little surprising that Cleopas never once nudges his traveling partner and says, “Amazing resemblance, isn’t it?” Even as Jesus illuminates the Scriptures, teaching the way he did throughout his ministry, the disciples fail to realize that they are walking with their Lord and Master. For whatever reason, Luke tells us that the eyes of these two men were kept from recognizing Jesus, that they were not aware that they were having an experience of the risen Christ until it was explicitly revealed to them. What was it that kept the disciples from recognizing the true identity of their traveling companion? When the passive voice is used in Scripture (as in situations like this), it’s very frequently a divine passive, a nod to the Jewish convention of refraining from saying the name of God. In other words, Luke is probably suggesting that God is keeping the disciples from recognizing Jesus. This leads us to wonder: why is this? Why does God prevent the disciples from understanding that they are in the presence of the resurrected Christ? I think we can begin to answer this question by looking at Cleopas’ very first response to the unknown traveler. The hidden Jesus asks the men the what they are talking about; Cleopas responds by saying, “Are you the only stranger in Jerusalem who does not know the things that have taken place there in these days?” Cleopas specifically calls Jesus a stranger, literally “one who is outside the household,” one who is not within the circle, one who would not typically be part of the fellowship of the community. In Luke’s gospel, this is a significant word, because so much of Jesus’ ministry is with those who are on the margins of society, those who are outside the community, those who are strangers. By calling Jesus a “stranger,” Cleopas identifies Jesus with those whom he served throughout his earthly ministry. By calling Jesus a “stranger,” Cleopas inadvertently sets the tone for the whole conversation. In other words, attentive readers of Luke’s gospel are invited to watch this interaction on the road to Emmaus and see how well the disciples of Jesus follow the example of their Lord and Master. So when we get to the pivotal moment of this story, the moment when the disciples decide to stop for the evening as Jesus continues walking down the road, we should all be holding our collective breath. Will they offer the stranger hospitality? Will they reach out to this person on the margins? Will they do as Jesus himself would have done? We can breathe a sigh of relief as they exhort Jesus with those beautiful words, “Stay with us, for evening is at hand and the day is past.” The disciples reached out to the person on the margins. The disciples began building a relationship. The disciples invited the stranger to the table. Important things happen around tables in this gospel. In Luke, tables are often where the community expands its understanding of who belongs. It’s at the table of Simon the Pharisee, for instance, that Jesus offers forgiveness to the sinful woman in chapter seven. And in some ways, the meal we read about this morning is the ultimate example of table fellowship reshaping the way we look at the world. The disciples share a meal with a stranger, and that stranger is revealed to be Jesus Christ himself. It’s important to notice that the disciples do not simply provide Jesus with food for his journey; they invite him to sit at table with them. The disciples do not simply provide for the stranger; they invite the stranger into a relationship. A few months ago I attended a conference where I heard a speech by the founder of the largest food bank in the country. He was telling us about his history, specifically about his first job after graduating. Whatever his official job description, he spent most of his time providing resources to people who came in off the street looking for help. On one occasion, he was having a particularly productive day. He was able to provide for everyone or at the very least point them in the right direction. He was feeling pretty good about himself until a young woman with a small child came into his office. She began to tell her story and shared some of the things she had been struggling with. His response was to offer her a bus pass, to put her in touch with a free clinic, and to call down to the food pantry to pull together a sack of groceries. He stopped in his tracks, however, when the woman said, “You don’t respect me, do you?” Incredulous, he said, “Of course I respect you,” thinking “I’ve taken time out of my day to help you.” Shaking her head, the woman said, “I know where to find bus passes. I know about the free clinic. I even know where to find food. I came here because I hoped I could tell you what was going on with me.” She was looking for a relationship. Instead of seeing this woman as a human being, he saw her as a statistic. Instead of inviting her to the table, he tried to send her on her way. Instead of seeking to be in relationship with her, he treated her like a stranger. There are moments in all of our lives when we fail to welcome the stranger. So often, this failure stems from fear: our fear of the unknown, our fear of those who are different, our fear of coming in contact with the brokenness of this world. When we are plagued by these fears, we are called to remember the most significant and dramatic moment of the Emmaus story, the moment that Jesus is revealed to his disciples in the breaking of the bread. This moment is not significant because the breaking of the bread is somehow magical; it is significant because it points to the fact that Jesus Christ is revealed to us in brokenness. Jesus Christ is revealed to us through the young mother who struggles to make ends meet. Jesus Christ is revealed to us through the man in prison for crimes to heinous to mention. Jesus Christ is revealed to us through the person whose lifestyle we cannot understand. Jesus Christ revealed to us through the friend whose life has changed so much that she no longer seem to be the person she once was. As Christians, we are called to see the face of Jesus Christ in the face of those who are different from us. We are called not only to provide for those in need, but also to be in relationship with those who need our help. Above all, we are called to recognize that in God’s kingdom, everyone belongs and there are no strangers.